This is one of several profiles of the people who make the Mission District what it is today. They are part of our My Mission Zine. You can buy a copy here. As a child, Jennifer Ng was quiet and unsure of herself, seldom raising her hand in class. But the internet changed all that for her. She started blogging prolifically toward the end of high school, gaining an ease with language and self-reflection, as well as the technology itself. In college, she studied how people and computers interact, and that led to a career helping companies optimize their software users’ experiences. Somewhere along the way she also developed an addiction to writing. Possessing dual citizenship in San Francisco’s struggling art scene and thriving tech industry, 33-year-old Ng has learned to live with a permanent, softly nagging identity crisis. Many of her friends have been priced out of their San Francisco homes, and she has considered moving to the East Bay to join them. 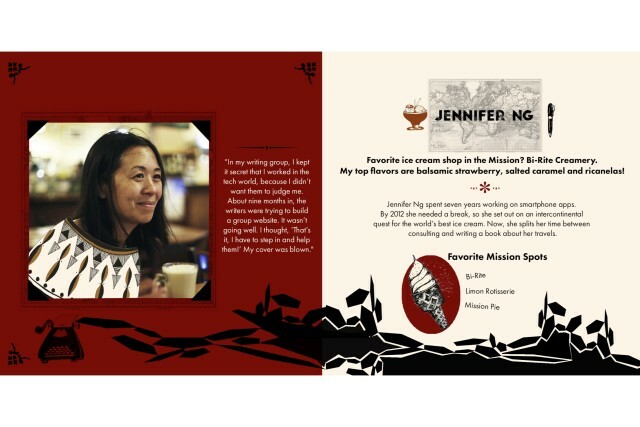 But she said she’ll hold on to the Mission District for as long as she can, since all the staples of daily living are nearby: corner markets, restaurants, bike shops and her personal favorite, ice cream parlors. Ng is an ice cream aficionado the way other people are beer snobs. Yes, she often makes her own. No, it isn’t always palatable. Ginger-carrot was a bust. And, because she didn’t adequately boil down her lemongrass-bubblegum batch, “it was just a sloppy mess” when she was done with it. Watermelon-tequila was a total hit with her friends. But she’s also scoured the globe to find the very best ice cream. In 2012 she departed the fog city for Seattle, then on to Vancouver, Ohio, the Philippines, Taiwan, Argentina, Los Angeles, New York, Philadelphia, Italy, and she finally ended her journey in Turkey. In Istanbul, she met a man named Yasar Usta, who had risen out of poverty to run a gelato shop. As an orphan child living on the streets, he had sought a better life by stowing away on a ship bound for Italy. There, he’d gotten a job making gelato, and after he mastered the craft he brought it back to his birthplace, making the dessert from locally grown fruits and selling it to nearby residents at a discount. Ng documented the scrumptious saga in her book, “Ice Cream Travel Guide,” which she finished in December after four years of research and writing. At times, she had been frustrated by how long the project was taking. Her work in the tech sector seldom left her large chunks of time to sit down and write, and removed any financial incentive to do so. Other people face the same obstacles, Ng has found. Once, she tried to start her own writing group with her coworkers, but they were “people like myself who are dabbling in it,” she said. “They were even more removed from writing than I was. They were like, ‘I’m so busy, I can’t write.’ ” The group soon dissolved. Her double life is hard to maintain, and it can leave her feeling slightly uncomfortable around both her tech colleagues and fellow writers, who will almost certainly never meet each other, she said. Would she ever consider giving up the written word?